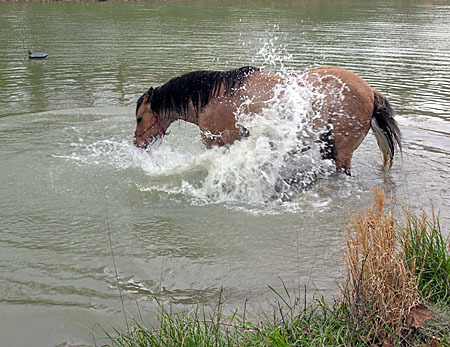 On occasion, we allow our horses the opportunity to swim in one of our ponds. 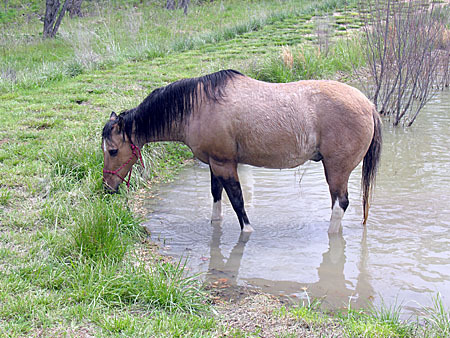 Chipper, our middle-aged gelding, really enjoys the water. For some reason, he always likes to paw at the pond water, as you can see above. The pawing starts off with gentle strokes of his front leg, but before long, the activity becomes more frantic, splashing water all over the place. Soon, all of this commotion draws the attention of Gracie, who feels compelled to check out the activity going on at the pond. Eventually, the whole gang gets involved. Chipper, meanwhile, continues non-stop with the odd water pawing behavior. He wants to be sure that every fish in the pond knows of his presence, I guess. Content in the knowledge that he has successfully sullied the pond for the next few days, Chipper grabs a few bites of grass before heading back to his grazing pasture (located away from the pond, of course). This entry was posted in A Rancher's Ramblins by Hal Mitzenmacher. Bookmark the permalink. We plan on putting in a pond someday. This looks like fun! Nice photo essay. Sharp looking horses. And doggie. This started me thinking about how we (humans) often underestimate the emotional capabilities of animals. Even the word “dehumanize”, oft-used synonymously with “incapable with feeling, and therefore not worthy of consideration”, is strictly used for … humans. We have no such concept of “de-animalize” that has equivalent meaning for our non-human, animal counterparts. Perhaps this is why we consider our own pets as “family”, thereby providing them with human-like qualities. Duane – Ponds are fun, except when they don’t behave according to plan. As in when they dry up in a drought, or turn green with algae, or fail to hold water. 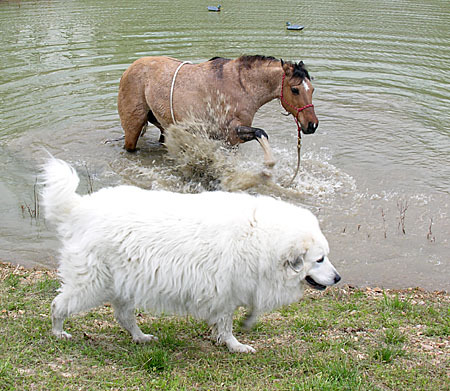 Pablo – The horses and doggie thank you, as do I.
I spoke with some of my horsey friends at work and they said that this pawing behavior is common with their horses too. 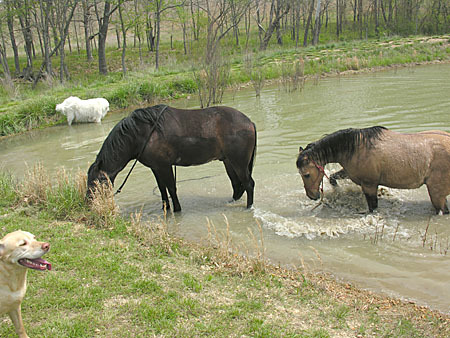 One even said that she has horses that will lay down in the water and thrash about, seeming to enjoy it the whole time. At least, he didn’t get down & roll in the water with you still on … they like to do that! Dr. John sent me over … I’ve bookmarked your page & forwarded it to my son; they raise AQHA reg. Buckskins. I had no idea horses played in water. Hi! 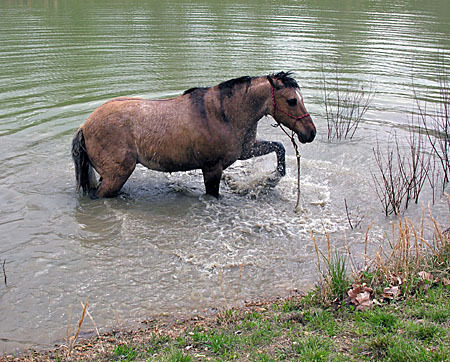 Horses don’t see water like we do, even when the bottom is visible–there’s no depth perception looking at the water. So they have to “test the waters”, and of course that’s why some horses are “afraid” of the water–for all they know it’s a bottomless pit. But they learn, most of the horses I’ve ridden through water for the first time pawed/hoofed it. Probably in testing the water by pawing your horse figured out he likes splashing, like what kid doesn’t? !